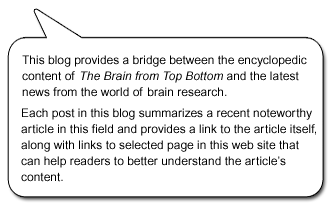 Well, the on-line donation system to let our readers help fund The Brain from Top to Bottom is still up and running. To learn more about why we have turned to you to help meet our budget, and how you can make a donation, please read the column to the right. Here is a recent update of our fundraising campaign. In the first two weeks of the fundraising campaign that we began in April 2013, we raised nearly $2 500. Since then, we have raised another $1 750, for a total of $4 250, and we want to say many thanks again to all of you who have contributed. Thanks to your generosity, we expect to be able to keep this web site operating and to keep adding new posts to the French and English blogs. But to start producing new content on new topics for the site itself, we will have to have more funding. We are still making every effort to secure ongoing funding from major institutions, but that is a lengthy process, and we can’t be sure whether or when it will succeed. In the meantime, contributions from readers like you will continue to be the lifeblood for our efforts, and we hope that you will chip in as much as you can. Do you love in-depth interviews with famous names in the vast field of cognitive science? Does the idea of spending an hour with philosopher Patricia Churchland, neurobiologist Christof Koch, or affective neuroscientist Jaak Panksepp sound pretty good to you? Then you have to take a look at the web site Brain Science Podcast! The media nowadays often publish reports that scientists using brain-imaging technology have just discovered the brain’s “centre” for anger, jealousy, generosity, or some other specific emotion or cognitive function. But the idea of such a centre is, at best, an outrageous oversimplification, and at worst, completely misleading.